Situated in the beautiful mountain setting of Cranbrook, the Canada Select 4 ½ star Prestige Rocky Mountain Resort is located on Van Horne Street (Highway # 95) close to downtown and adjacent to the Canadian Museum of Rail Travel. The resort, 306 km (190 mi.) northeast of Spokane and 403 km (250 mi.) 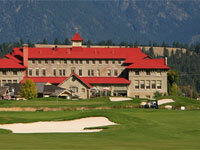 southwest of Calgary, is the ideal destination choice for conventions and retreats. Activities for the outdoor enthusiast such as biking, golfing, skiing, fishing, hiking, swimming and cycling are all easily accessible from the resort. Our friendly staff at The Prestige Rocky Mountain Resort is ready to welcome you and offer our rare brand of hospitality. Nestled between the Purcell and Rocky Mountains near Kimberley & Cranbrook, British Columbia the St. Eugene Golf Resort & Casino is a magnificent resort that offers gourmet dining, world-class golf, elegant rooms and casino nightlife all at one breathtaking location. St. Eugene is a place of fun, relaxation, exceptional service and outstanding value.